When SQL Server 2008 R2 was first released, I wrote a quick blog post discussing the additional space savings gained by Unicode compression. In one of the follow-up comments, Adam Machanic was quick to suggest that compression can bring significant CPU overhead, and can as much as double the amount of time it takes to retrieve data. He was absolutely right that I was extolling the space savings of the feature, but pretending that there was either no cost or that the cost was worth it. My gut feeling is that, while additional CPU overhead is almost guaranteed, the overall duration should go down in many cases, because most systems are I/O-bound; thus, the extra CPU cost is more than compensated for by the savings in I/O. The algorithm is also smart about not compressing the data at all if it does not consider that enough space will be gained by doing so, so in cases where the space savings would not be significant, no extra CPU cost is incurred because no compression/decompression needs to occur when reading or writing to those pages (and there are neat little tricks that help the engine determine which pages are compressed, and which are not). But why rely on a gut feeling? I wanted to put this to the test. Pretty simple, actually. Create tables with compression = page / row / none, fill up one or more NVARCHAR columns with random Unicode data, and measure read/write operations as well as storage requirements. Compare page / row / none within R2 (where Unicode compression can take place), within 2008 SP1 (where it cannot), and ultimately against each other. Hopefully, this will help show whether there are cases where the benefits of Unicode compression outweigh the costs. Full disclosure: these are two named instances on the same hardware, running in a virtual machine, with 4 virtual processors and 8 GB of RAM. The operating system is Windows Server 2008 R2 x64 RTM, the underlying disks are SATA, the host operating system is Mac OS 10.5.6, and the VM was built using VMWare Fusion 2.0. Performance metrics : from a trace, I will measure Duration, Reads, Writes, and CPU. Storage metrics : sys.dm_db_partition_stats will show how much space is occupied by each version of the table. In the first test, I will create a single-column heap. I am going to be tracing this activity (using SQL:BatchCompleted), so adding the type of compression in use at the beginning of each batch will allow me to easily group and aggregate based on each type of compression. I repeat this above script for DATA_COMPRESSION = PAGE and DATA_COMPRESSION = ROW. Now, this data is neither sequential nor is it indexed, so because the data is scattered all over the place, I would not expect page compression to help out a lot (since it depends on dictionary and column prefix compression, which look for similar patterns on the same page); likewise, because the lengths of all of the values are in the 1,950-2,048 character range, we're not going to get anything out of row compression, either. Performance should not be great because of the additional TABLOCK hint that is required in order to utilize page compression on a heap. As it turned out, the nature of the data and how it filled the pages made it so that on a heap, page and row compression yielded exactly zero benefit in terms of storage space (and since the engine decided not to actually compress any of the pages, Unicode compression did not kick in either). In any case, I wanted to use data that was large enough to show statistical discrepancies in the overhead of reading/writing data, and the only way to ensure that Unicode compression could be used is to enable page compression, even though in this case it turned out to be a flop and a major resource drain in rounding out this post. Though I will treat this as a special case and cover at least the storage savings that *can* be achieved with Unicode compression, even on a heap, towards the end of this post. Again, I create copies of this script with minor changes for both PAGE and ROW compression. My third test script mixes it up a bit by adding multiple columns, a composite clustered index, and a couple of non-clustered indexes as well. I also insert each simulated row 5 times. This has two effects: 1) it substantially increases I/O on both DML and SELECTs; and, 2) by fitting much more data on a page *and* ensuring there is a lot of repeated data, it gives us much greater opportunities for taking advantage of PAGE and ROW compression algorithms. Yet again, there are two other versions of this script, which only differ in the compression method in the comments and in the table declaration. Make a note of the output in both cases, because after you run the tests, you will need them later to pull data from the trace output and ultimately to shut down and dispose of each trace. Now, when I am actually going to run the tests, I make certain that I connect as the UnicodeTesting SQL authentication login, and not as the Windows authentication login I would normally use for any other activity. Not for security purposes, but to make sure the tests get picked up by the trace, and also to prevent the trace from being contaminated with non-test-related data that I will only have to filter out later. Then I run them all — in sequence, not in parallel, so that they do not interfere with each other, since they all share the same limited hardware. I found that most of the scripts would take upwards of 20 minutes to run on my paltry VM, so I was in for a long afternoon waiting for one script to finish before I fired off the next. I didn't feel like rigging up some tool to automate that (again, it would probably have taken longer in the long run, for this battery of tests). Hey, I had other computer stuff to do while I was waiting, don't worry. I then output the data into Excel, moved it around, waved my hands a bit, said some magic words, and tried to generate pretty charts like Linchi always does. I pulled out three interesting graphs from this data: duration, CPU usage and space savings. From the tests I performed, Unicode compression (when actually used) reduced space usage in every example — though I left the heap out of the graph, since the gains were 0 initially. And in almost every case, overall duration and CPU utilization of the same code went down when using compression (the exception is for the table with multiple indexes, where index maintenance overhead yielded slightly longer runtimes – but barely). In general, durations were lower in SQL Server 2008 R2, and this was repeatable no matter what order I ran the tests in. I am not sure if I was seeing the benefits of untold enhancements there, or cosmic rays, or gremlins, or what. I left the I/O metrics I captured out of the analysis, because the differences were negligible across all of the tests. 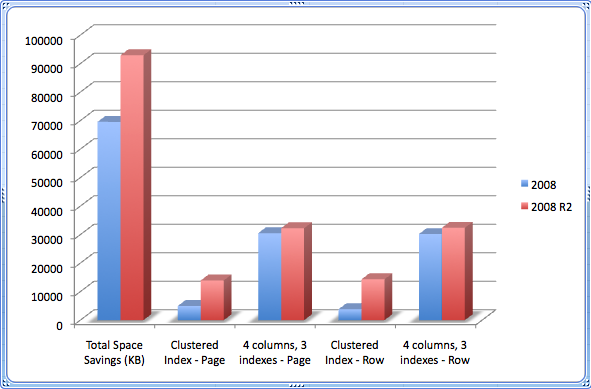 The charts speak for themselves… as long as your index maintenance is not incredibly high, there can be some significant gains in using compression on NVARCHAR columns, and that only gets better in SQL Server 2008 R2. In 2008 R2, the rebuild provides a significant space savings, all due to Unicode compression. I can assume this because, without the Unicode compression, I actually *lost* a tiny sliver of space on the heap in SQL Server 2008, after performing the same rebuild with the same page compression setting. If your system is already CPU-bound, then maybe data and backup compression are not for you in the first place, so you won't benefit from Unicode compression either. It may also not be a very useful enhancement for you if you have few or no NVARCHAR columns (but you get it for free if you are using page compression anyway; there is no separate option). We are in the opposite scenario, because we are I/O bound and have a lot of NVARCHAR columns, so I think we could benefit greatly from further compression — on top of what we already expected to gain from page compression (dictionary and column-prefix compression) and row compression (variable length storage). And even if you can't benefit much from page and row compression, you may still benefit from Unicode compression once you have enabled them. I later plan to investigate what happens with "more traditional" data in a "more common" scenario, where NVARCHAR is in use in an English scenario and the actual extra-byte characters that are in use are few and far between. I suppose I could take the script above and just make the input string a lot longer, and contain very few "foreign" characters. More likely though, I will generate all of the test data in one pass, and use BULK INSERT to populate the tables — this will ensure that every single version of the table contains the exact same data, and hopefully will use compression automatically on a heap without having to manually rebuild. But not today. It's amazing sometimes how these "simple" experiments steal away your entire weekend. Once you are done with analyzing the trace output, delete the .trc files from the file system. I will certainly use this thing. I didn't like vardecimal, so I didn't think I would like the next evolutionary step either, but this looks sweet. Wonder if anyone has measured unicode compression vs typical VARCHAR on large data bases running on serious hardware. Should be interesting. Yes, I agree the data was not very realistic, and stated that I would like to further my research by performing more real-world tests in the future. Interesting tests, Aaron. I'm surprised that you're actually seeing lower CPU utilization in some cases–I'll definitely have to dig in to those tests. Thanks for posting this. Adam, I found it surprising as well. What I didn't show in the graphs was a comparison of no compression at all vs. page + Unicode compression, but on one version. Comparing compression on 2008 vs. compression on 2008 R2 was my main target, as I was trying to demonstrate how much CPU Unicode compression alone would add. Unfortunately this back-fired as I am trying to compare too many variables. "…as part of the performance testing of Unicode Compression I refactored the code paths that gets used for the other compression data types as well. Further, I was able to get about 2-3% of performance gain by refactoring a comparison routine that was used for both compressed and uncompressed data. By splitting the function in two, actually both the uncompressed and compressed codepaths got faster, as the compiler was able to better inline the code in both cases." So it turns out that my guess was right: there *is* some tuning in R2 that we don't yet see in 2008, though it seems unlikely to me that those optimizations will ever make it back into the original 2008 codebase.